Something we missed? Submit a question now. The theatre provides seating for persons that require ADA seating with companion seating if necessary. The theatre sound system is equipped with hearing assistance. Both headphones and neck loops are available at no cost. Simply ask at the box office or concession stand if you would like to use one for an event. The sidewalk underneath the marquee may also be used for drop-off and pick-up. The DeKalb area is serviced by 3 major airports: O’Hare International Airport, Midway International Airport and Rockford International Airport. The DeKalb Municipal Airport is located just minutes away from the theatre and can accommodate private planes. For safety and as a courtesy to other patrons, please do not sit or stand in the aisles. Aisles should be kept clear at all times. We ask that you comply with these policies. Any patron not in compliance is subject to ejection. The Egyptian Theatre has a strict policy towards animals on the premises and therefore does not allow animals or pets at The Egyptian Theatre under normal circumstances, with the exception of service animals such as guide dogs. The ADA defines a service animal as any guide dog, signal dog, or other animal individually trained to provide assistance to an individual with a disability. There is an ATM in the theatre lobby for your convenience. One hour prior to all events. 30 min prior to movies. Video cameras, monopods, tripods, audio recording devices and cameras with telephoto or zoom lenses, including SLR’s, are not permitted for most events at the Egyptian Theatre. For each event this decision is made by the producer or promoter typically because of strict copyright laws or for the safety of performers. This policy will be strictly enforced. Please check with the box office to see what is allowed for any specific event. The theatre does not have a coat check. Outside food or drink is not permitted. The theatre has a concession stand which is in operation for all of our shows and features Coke products, popcorn, and candy. All items may be taken into the theatre during events. For some events a cash bar is open in the lobby. Click here for a list of nearby dining options. Doors open an hour before any live performance or event unless otherwise specified. Doors open 30 minutes before any film unless otherwise specified. Unless otherwise noted, The Egyptian Theatre does not have a formal dress code. We do ask, however, that you use your best personal judgment when dressing for an event. Due to the historic nature of the Egyptian Theatre, built in 1929, there is no elevator in the building. Our event schedule changes from frequently. Click here for the current schedule. If a performance is playing multiple nights and tickets are still available we can exchange tickets for an alternate performance after they have been purchased. Ticket exchanges are subject to a $5.00 convenience fee per order. We now offer gift cards that can be purchased at the box office. Gift cards offer flexible dollar amounts. Gift cards can be used at the box office, online box office, and at concessions. The distribution of promotional items, flyers, handbills or printed materials is not permitted without written permission of The Egyptian Theatre. In addition, vending, peddling or product sampling is not allowed. The theatre is available to area ghost hunters and paranormal investigators. More information regarding haunted tours is available in the rental section. 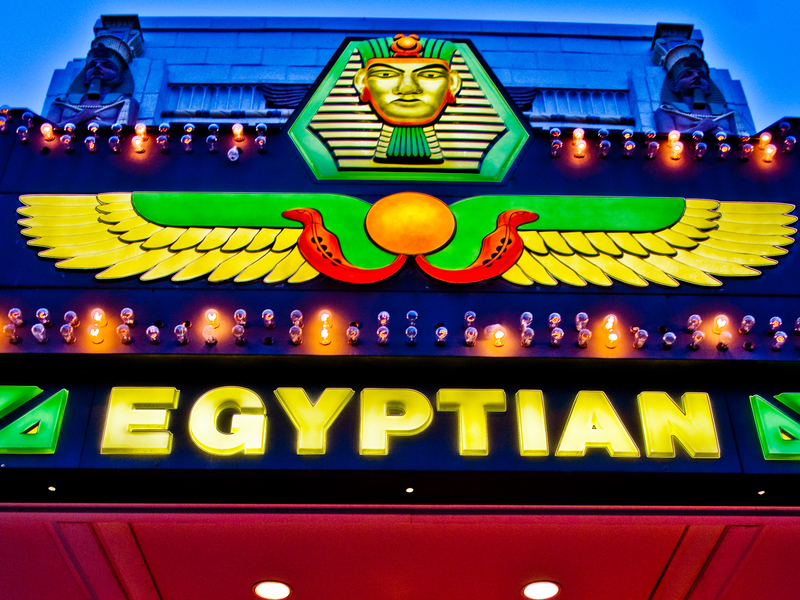 Opened in 1929, The Egyptian Theatre is listed on the National Registry of Historic Places. To read more about the history of the Egyptian Theatre click here. Follow the Theatre on Instagram. Click here for information on local lodging options. If you’ve misplaced an item while you’re still at the theatre, please visit our Concession Stand in the Lobby and check with one of our volunteers. Any items found by ushers or other patrons will be taken to the Concession Stand. If you’ve already left the theatre, please call the theatre at 815-758-1215 and we’ll be happy to check our Lost and Found for you. Our membership page can be reached by clicking here. There is ample free parking near the theatre. Parking area map. Box Office: We accept cash, Visa, MasterCard, and Discover credit cards/debit cards. Checks made payable to the Egyptian Theatre with drivers license are accepted. P.E.T. stands for Preservation of the Egyptian Theatre. P.E.T. is a 501(c)(3) nonprofit organization. More information can be found here. Video cameras, monopods, tripods, audio recording devices and cameras with telephoto or zoom lenses, including SLR’s, are not permitted for most events at the Egyptian Theatre. This policy will be strictly enforced. Please check with the box office to see what is allowed for any specific event. All sales are final. No requests for cancellations, or refunds are accepted. In the event that a performance is either cancelled or postponed, the Egyptian Theatre will make every effort to contact every patron via e-mail, time permitting. Refunds on tickets purchased are made for a cancelled or postponed event only. In all instances when a ticket is refunded, only the cost of the ticket is refunded. Please also see “Exchanges”. Click here for information on renting the theatre. General admission seating means that there are no assigned seats. Reserved seating specifies which seat you will be seated in for an event. The theatre can seat a maximum of 1,397 with 847 on the main floor (8 wheelchair seats available with reduced capacity) and 550 in the balcony. By law, smoking in all areas of The Egyptian Theatre is prohibited. You may smoke outside the theatre building; however, you must retain your ticket for admittance back into the building. The Egyptian Theatre has Twitter and Facebook pages. Use either, or both, to stay up to date on theatre activity. In addition the theatre has a monthly newsletter which contains information on upcoming shows and events. Tickets can be ordered online. Tickets can be purchased over the phone by calling 815-758-1225. Tickets can also be purchased during box office hours, Tickets can be held at Will Call, mailed, or printed at home. As a courtesy to our patrons, it is the policy of the theatre not to admit children under the age of 3 years. This policy may be altered from time to time based on Shows and Show content. You will be made aware of particular age restrictions during your purchase. Some shows make further age appropriate recommendations and the Egyptian Theatre will provide those on its Website; however, judgement of the content for each show should be made on an individual basis prior to purchase. All patrons, regardless of age, must have a ticket. There are additional fees added to the purchase of tickets when tickets are purchased online or over the phone. Tickets purchased in person at the Egyptian Theatre box office do not incur any fees. Tickets purchased online or over the phone also have delivery options which may incur additional fees. The Egyptian Theatre rarely cancels or postpones events due to inclement weather. Please be advised that tickets for all events are sold on a non-refundable and non-exchangeable basis. This stipulation is clearly marked on each ticket. Should a decision be made to cancel or postpone an event, this information will be posted, as soon as we receive it, on our website as well as on our main information telephone line at 815-758-1215. Please continue to check our website and call our main information telephone line for the latest, up-to-the-minute information. Check our volunteer page here.